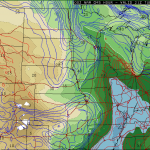 Forecast models the day before were showing dewpoints reaching the 60° mark in the warm sector from Davenport, Iowa south. 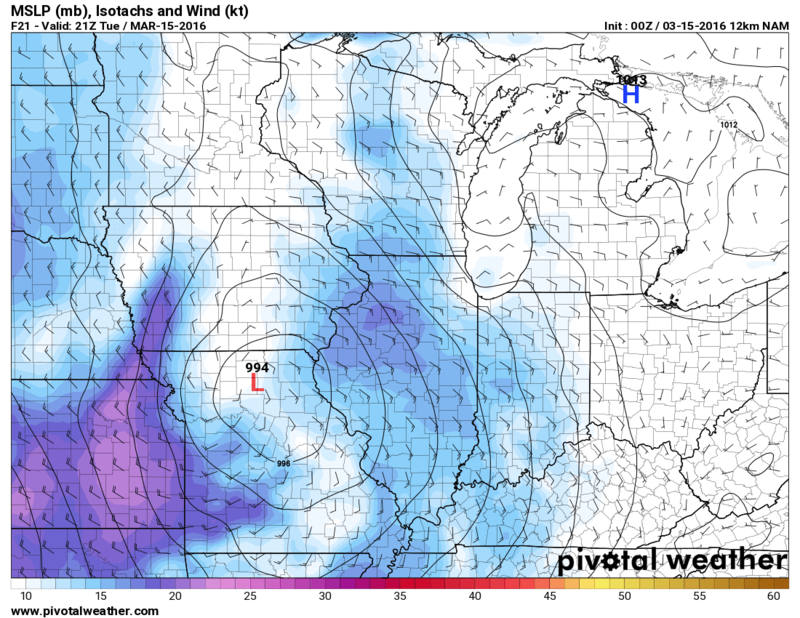 This below a negatively tilted trough at 500mb with the left exit region squarely over the target area, while a surface low was expected to strengthen and move across Northern Missouri into Wisconsin throughout the day. This setup looks pretty good to me, so I had requested the day off expecting to chase. SPC had a broad slight risk across the target area from Iowa City to Western Ohio and south to Peoria. My original plan was to head to Jacksonville, Illinois as my staging area for the day. 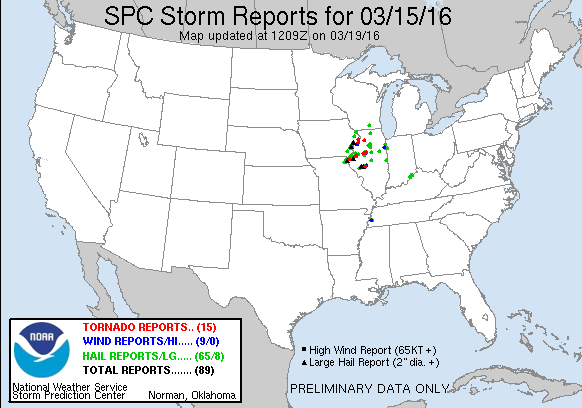 I left Michigan before 12z and began the trek west. 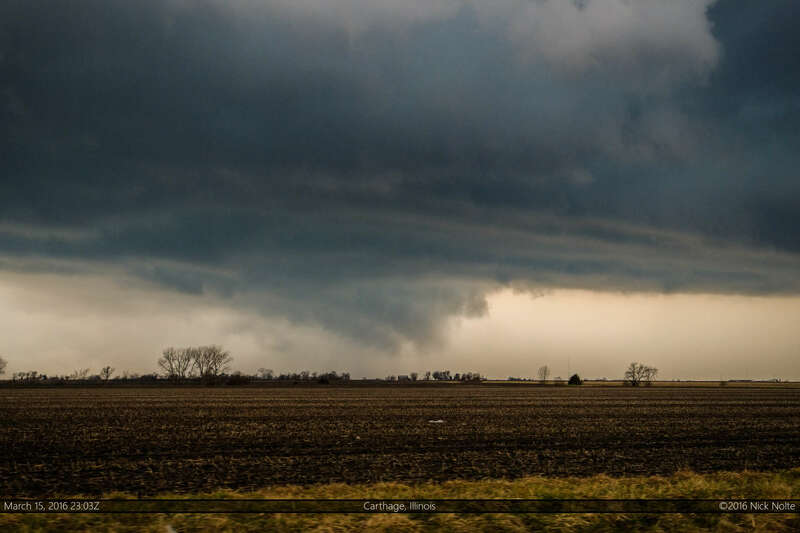 A couple hours down the road the SPC issued the 13z update and had indicated a focused area of enhanced risk that included the Illinois, Iowa and Missouri tri-state area. 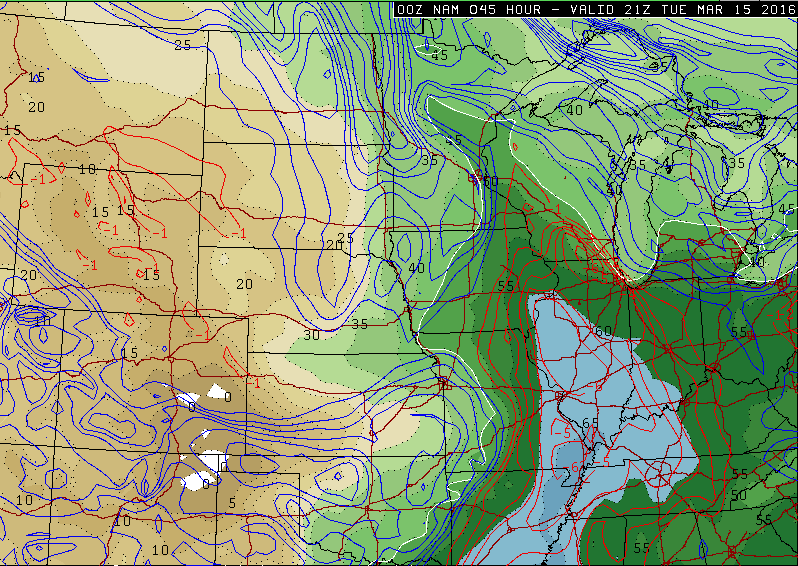 I wasn’t really buying that we’d get low 60s dews up to the I-80 corridor, so I was sticking to my original plan to head to Jacksonville. 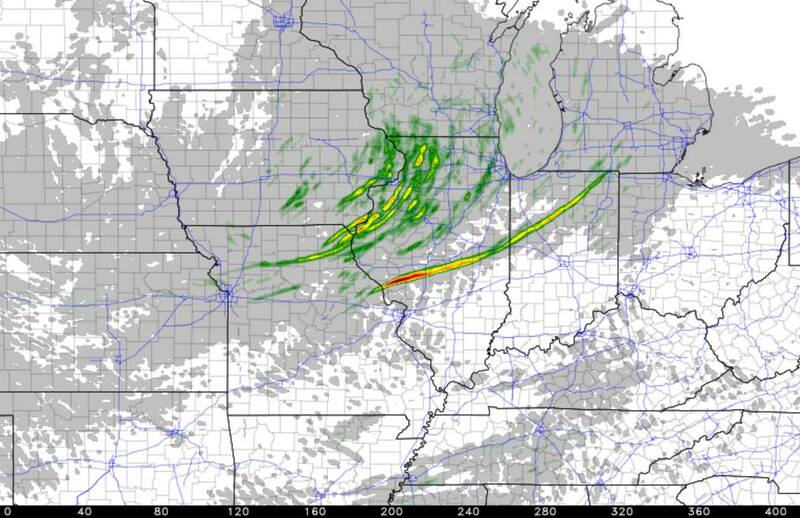 Throughout the day the HRRR model was hinting at a long lived supercell tracking across Illinois, Indiana and into Michigan which it initiated in Missouri around 21z southwest of Hannibal. This feature persisted for at least 9 runs of the model between 13z and 21z within the general vicinity, so that was interesting to watch throughout the day. 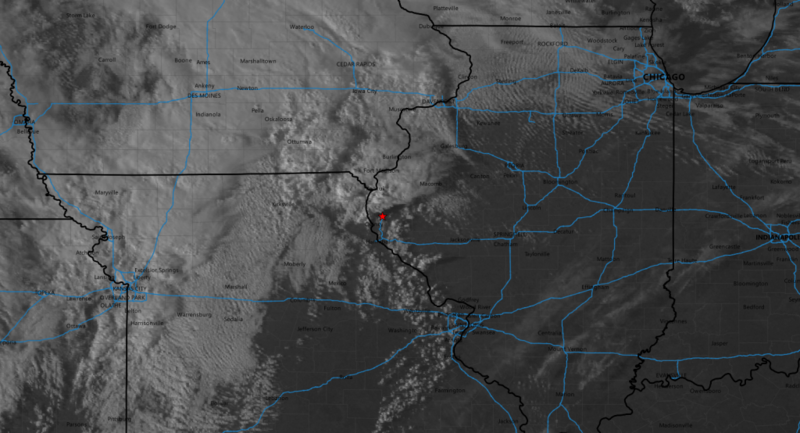 I arrived in Jacksonville at 19z and with some cumulus showing up on visible satellite in Missouri, I figured the show was going to start further west, probably in Missouri, so I continued on to Barry where I sat and watched visible satellite. Shortly after, the tornado watch was issued for the area with surprisingly high probabilities: 70% chance of 2 or more tornadoes and a 50% chance of a strong one. I had to make a decision on whether or not to move north where storm initiation appeared imminent, or hold south to see if the HRRR prognostication would pan out. As it approached 4pm I started to worry that the cap might hold to the south until after dark. 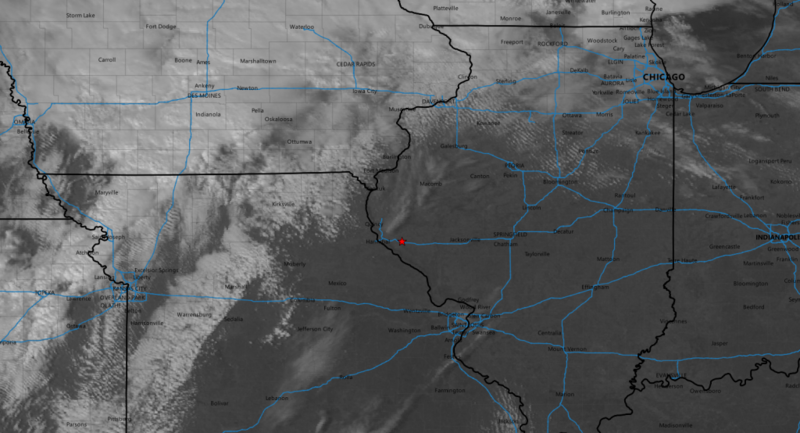 With only three hours before sunset, it was looking less likely that initiation and the requisite time for development on the southern target would happen during daylight. 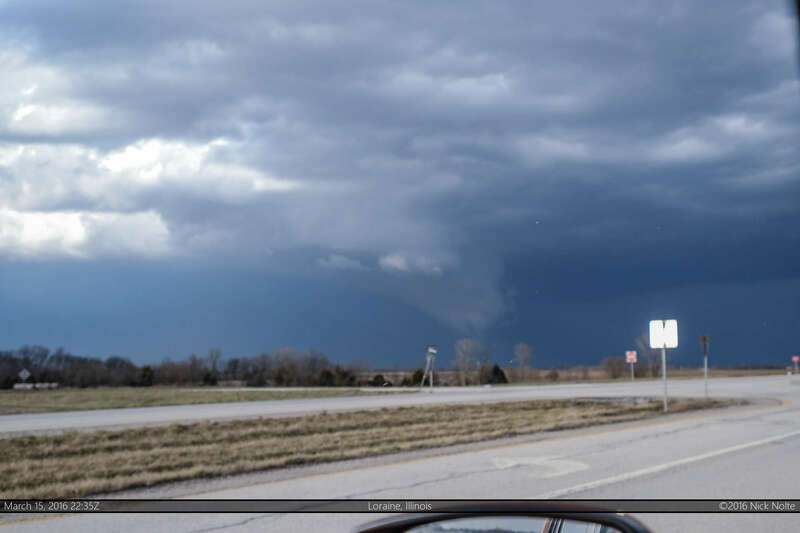 So, I drifted northwest to Quincy where I met up with a bunch of other chasers northeast of town while we watched cells begin to fire to our west. 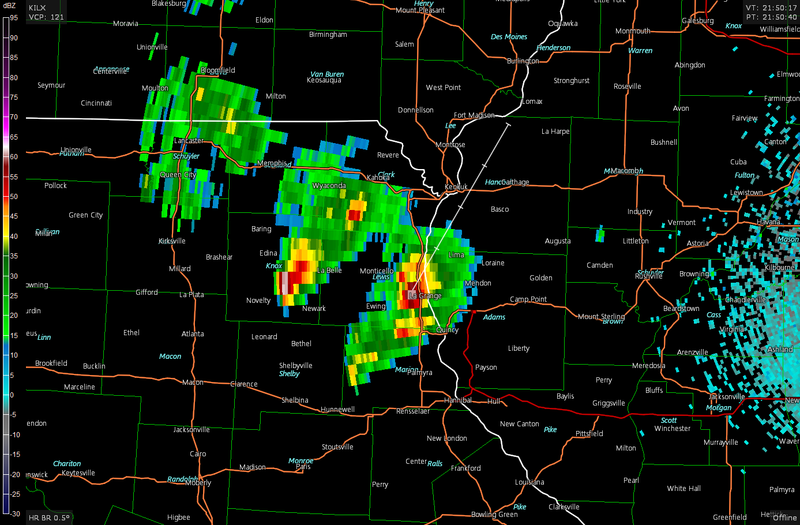 I moved north to intercept the lead cell and while it had a lowering it looked pretty disorganized. While I was following the lead storm, the storm behind it was issued a tornado warning with a LSR. 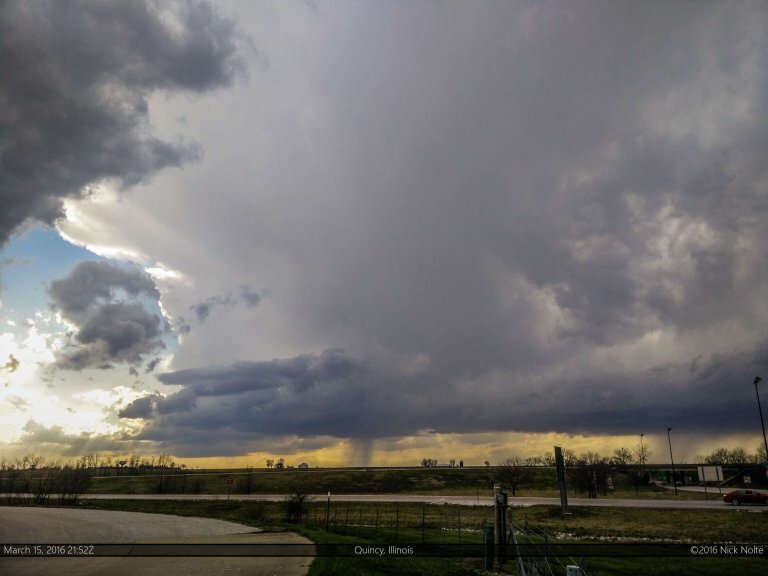 With this storm looking a bit disorganized, I pulled off and decided to get a look at the second storm. I met up with the second storm near Carthage and it looked a bit more interesting, but this was as good a look as I would get of anything below this storm. I decided to stick with it as I was going to be unable to reposition to anything better before light started to disappear. During this time, a cell started to pop in Pike County southwest of Jacksonville where the HRRR had been prognosticating that long track cell, it was just a few hours off on initiation. I continued to follow the storms and they began to congeal a bit as they approached Peoria. I had been following along east on State Route 9 and was going to attempt to turn north at Canton and try to beat the storm to Route 116, but didn’t pull it off as I encountered 2″ hail before retreating back to route 9. Darkness set in on the chase day and I was finished, now my goal was to begin the trek home and stay in front of the storms encroaching on the Peoria area. Meanwhile, to the south, that cell in Pike County had intensified and moved on towards Springfield with attendant tornado warnings. It would end up dropping an EF-1 tornado on the west side of Springfield just a few thousand feet from the house of fellow storm chaser Skip Talbot. I ended up getting home around 2:30am and even though I had to go to work the next day, I slept well knowing chase season was finally underway.